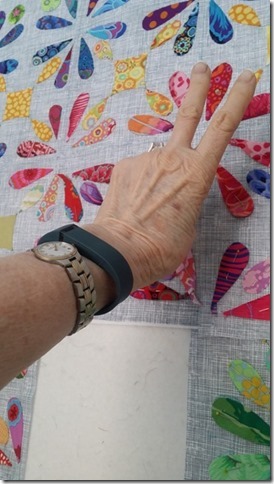 Jan Hirth sent me a picture of her Fitbit in front of her quilt-in-progress, Honey Beez! I can’t wait to see the finished quilt. Love the gray behind those splashy Kaffes. And, I must add that I’ll wear my sister’s watch on my arm, with the Fitbit, just like Jan is here. Not all the time, but often. Nice to know that that’s a thing people do :-). This entry was posted in Because It's Pretty, Color, quilt and tagged fitbit, quilt, quilt inspiration, show and tell by Becky Goldsmith. Bookmark the permalink. Exciting to see Jan Hirth’s latest creation. She does such beautiful work!